Kronomyth 7.0: Elsa im Wunderwand. Shortly before the sessions for Heroes, Eno joined Cluster (Hans Roedelius and Dieter Moebius) to record an album of instrumentals, released in Germany on the Sky label as Cluster & Eno. Available in most regions as a pricey import, the record presents Cluster’s typical toylike-melodies in a more sonorous and exotic setting. One presumes the latter effect was the result of Eno’s participation, although the album’s minimalist packaging shines no light on who played what. In my opinion, this is one of Eno’s least effective collaborations. I suspect that his Oblique Strategies played a hand in all this, and the trouble with oblique strategies is that, sometimes, they can take you in circles. Eno’s works from this period (Another Green World, Low, Before And After Science, Music For Films) are very interesting and engaging. Cluster’s albums too. But Cluster & Eno rarely approaches the quality of those works. You’ll hear a connection between “Für Luise” and “Moss Garden” in Eno’s luminous backdrop, detect elements of Another Green World and Penguin Café Orchestra in “Ho Renomo” (so named for the players involved: Holger, Roedelius, Eno, Moebius) and instantly recall Robert Fripp on “Steinsame” (one of two tracks here named for a flower). What you won’t encounter is the better work of Cluster or Eno. “Manchmal” from Grosses Wasser was charming in its childlike simplicity; “Mit Simaen” and “Selange” are annoying for the same reason. And I’m pretty sure “Die Bunge” is just an electronic version of “Happy Trails.” Cluster & Eno does contain a few interesting ideas (e.g., “Schöne Hände,” “Wehrmut”), but that’s a few less than you’ll encounter on most Cluster and Eno albums from this period. I’ve read rave reviews of this album (the geniuses at Pitchfork gave it an 8.7 out of 10), and the number that I keep coming back to is one. 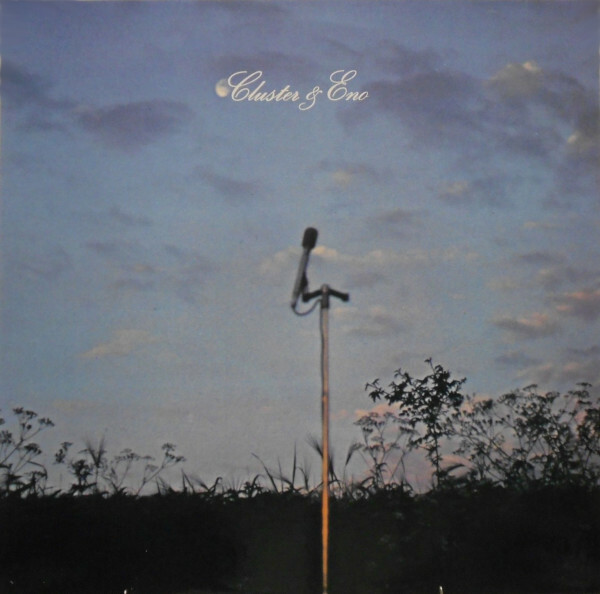 Listen to Cluster & Eno’s “One,” which makes heavy use of Eastern sounds, and tell me this record is markedly better than George Harrison’s Wonderwall Music, an album that is almost universally panned. Harrison was just a musical doodler, apparently, while Eno is a serious artist. If you believe that, well, you don’t know doodly-squat about doodling. All titles by Moebius, Roedelius and Eno. Brian Eno, Dieter Moebius, Hans Roedelius with Okko Bekker (guitar on B4), Holger Czukay (bass on A1), Asmus Tietchens (synthesizer on B4). Produced by Conny Plank and Cluster; engineered by Conny Plank. Released on elpee in August 1977 in Germany (Sky, sky 010). Re-released on 20-bit remastered compact disc in 1995 in Japan (Sky, PLCP-48). Re-issued on compact disc on February 13, 1996 in the US (Gyroscope, 6620). Re-released on 20-bit remastered compact disc in Japan (Sky/Platz, PLCP-105). Re-released on 180g vinyl elpee in 2007 in the US (4 Men With Beards).